This is an older park and has many camping sites from tents to RVs to yurts to tiny houses. It is "close" to the metropolitan Portland, OR area; it gets a lot of use. That said, it is a good place to stay as a central place to explore the Mt. Hood area, and it is open all year. There are many features for the campers of all levels, and a pool/hot tub/workout facility, and playgrounds and bike riding. The staff is OK, but often seem overcome by the stress of maintaining a place as big as this and with as many people who stay here. We would stay here again, largely because of its location. We camped at Mt Hood Village RV Resort in a Motorhome. Drive up in your car to Timberline Lodge on Mt. Hood. It is well worth your time....it is so gorgeous up there!! We have a favorite site that faces the west and the lake...it is gorgeous here and we have been coming up here for several years. Besides the peaceful and restful experience here...you are only about 35 miles from the Mt. St. Helens Observatory...a sight not to be missed. Sites are wide and well tended, as is the entire park. A good place to stay.... We camped at Silver Cove Resort in a Motorhome. Being a KOA park, there are features you expect. This park is better than others and a good park for children especially, as they have many features for them. This is a nice off-leash dog facility now, and the staff are very friendly and helpful. They want your stay to be a positive one. There is a drawback when getting here from I-5: look carefully for the left-hand turn and KOA sign to get to the park. Can be tricky for larger motor homes to turn around and try again!! We camped at Albany / Corvallis KOA in a Motorhome. About 2 miles further west toward Corvallis is a GREAT food cart serving BBQ...it is called "The Pink Rib." This is a State Park, and while there is a great deal to see and do here, especially great access to the Pacific Ocean, it can also be crowded. Many people come here to camp; there are separate loops for RV camping. Sites and loops can be a little tight but we had full hookup (no cable and due to trees-no satellite or antenna). The beach here is the main attraction. There is also an $8 vehicle fee, which is added on to your site fee. There are Camp Hosts for every loop, and they are very helpful...even bringing wood bundles by your site to purchase. If a quiet place with ocean views is your thing...this is not the park for you. We camped at Fort Stevens State Park in a Motorhome. The wreck of the Peter Iredale is still a draw for pictures and just walking on the beach. 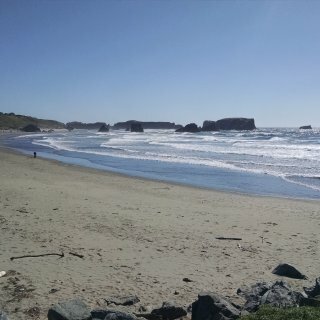 this small park 3 miles south of Bandon is a delight!! It is a friendly place, and you feel right at home, even with the long-term rigs and people. You are just a couple miles from the beach waysides and access to the gorgeous Pacific Ocean coast in this part of Oregon. 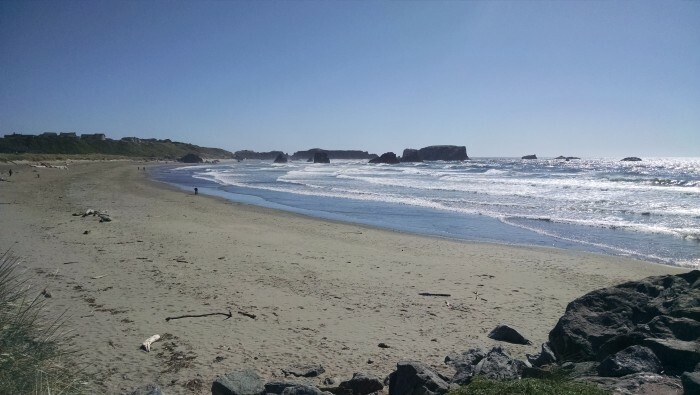 The small coastal community of Bandon has everything you could for a coastal adventure from sightseeing to beaches to great food to boat trips to even world-class golf at Bandon Dunes. If you are looking for a convenient and relaxing place to stay with good space for your RV...this is the one to choose when you stay in Bandon. We camped at Robbins Nest RV Park in a Motorhome. Great little used book shop nearby, and Bullard Beach State Park has the Coquille Lighthouse to tour. Both north and south jetties of Coquille River and good vistas. And, well, golf is pretty great up at The Dunes!! If you need to shop....Woodburn Outlet Mall is right next to rv park. While there are many long-term residents, the place was clean and well-tended. Sites are a little close together, but grass and paved roads and sites. Interior roads and parking seems close for the short-stay travelers like us, but it was OK. The park is close to on and off the I-5 freeway, and is good for travelers' needs...short stay or long. "Close" access to Portland, OR, as there are not too many RV Parks in the city itself...only in the surrounding communities. We camped at Portland-Woodburn RV Park in a Motorhome. This is a beautiful park in a beautiful part of central Oregon. The grounds are well tended and well planted with gorgeous native flowers, shrubs, and trees. We had a pull-in site beside the lake and the view was lovely, and all the geese and other birds around were a delight to watch. The accommodations for all campers were well designed and constructed...very nice!! The Dog Walk area is spacious; the open area of the rodeo grounds are grassy and great for pets. It was just so pleasant and restful here we wished we weren't at the end of our long summer trip and could have stayed longer!!! This will be a place we will return to!!! We camped at Bend / Sisters Garden RV Resort in a Motorhome. Make sure you visit the small city of Sisters, OR, just 4-5 miles to the west, for its eclectic and delightful shopping and restaurants. A very nice place to stop and rest out in the middle of the high desert of Oregon. It is a small campground, but sites were well arranged and with plenty of room for all types of rigs. Although it is along Highway 20, the road noise really isn't a factor. The Manager/Owner was very friendly and helpful, and you can tell they love this park by the effort they put into the grounds. And if you need groceries or have other needs, the community of Burns is just around the corner. We camped at Burns RV Park in a Motorhome. Even though our stay was over Memorial Day and the park was full, the staff made you feel like you were the only ones there. It is a great place to stay, and especially if you enjoy wine. There was a wine tasting event in the office the evening we checked in. The park sites are nice and roomy, and facilities are well maintained. Just about a 10 minute walk away are the Prosser Wine Country Tasting Rooms!! With over 35 wine growers located in the Yakima Valley, this is a fun place to stay and experience all that the Valley offers. There are several small communities nearby to explore, and the Tri-Cities are about 40 minutes east. This was our second stay here, and we will certainly come back to Prosser in our travels. We camped at Wine Country RV Park in a Motorhome. With the grassy sites along the Columbia River, this is a place you can stay overnight...or for weeks!! There is always something to see out on the river, and while it can get windy sometimes, it is a good place to stay. There is a marina next to the rv park, and you can easily put your boat in the river. Lots of walking trails for you and your pets, as well as bike riding. The small community of Boardman is about 2 miles away, and easy on-off from I-84 freeway. Satellite service and be spotty; ask for a site that is satellite friendly. We camped at Boardman Marina Park in a Motorhome. Nice grocery store south of the freeway, and C&D Drive In has the best milk shakes and hamburgers!! You pass it on the way to the RV park. With gorgeous views of the Columbia River directly in front of our site and the huge grassy lawn leading down to the beach, this is a wonderful place to kick back and relax. The park is about 3-4 miles west of the I-5 freeway, and easy access. While there aren't any restaurants or such within walking distance, Woodland is very close and so is a Walmart. The staff were very friendly and helpful, and the park is kept very clean. We certainly will come again, rain or shine.... The river traffic is another bonus; from tankers down to fishing boats there is always something to watch as the river flows to the ocean.... We camped at Columbia Riverfront RV Park in a Motorhome. If you are looking for a park with lots of extra things going on....this is not for you. While there are many day trips from the park you can take, this is a park with scenic and quiet time. Our favorite site looks west out to the lake (through the island) and the gorgeous nature that is Silver Lake. Mt. St. Helens is just an hour east, and the I-5 freeway is ten miles west. It is quiet here, peaceful, and a favorite spot since we started traveling!! They have cable, and if you watch the trees, you easily can have satellite with your full hook up. We camped at Silver Cove Resort in a Motorhome. We have stayed here before, and weren't disappointed with this stop. It is located just off the freeway, but noise is not an issue. The roads within the park are good gravel and very wide and level. While there are many permanent party construction workers, the rigs are well maintained and sites are neat and clean. There is an abundance of grass around the sites, and picnic table for each. Cable hookup is there, and satellite service is good (except under the old growth trees). While this was just an overnight stop for us this time, we didn't unhook the tow car, and had plenty of room at our site. We even took advantage of the dinner delivery from the cafe on site!! Great milkshakes. This is a good stop for 1 night...or more. We will stay here again. We camped at Village of Trees RV Resort in a Motorhome. For a quiet stay in a charming small community, this is the place for you. The owner is very friendly and helpful. The park itself has good gravel roadways and parking sites. The sites themselves are quite large and level, with lots of grass between sites. There are beautiful elm and cottonwood trees to provide shade, but could hamper satellite service. But there is excellent cable TV service. We also had strong Verizon service and did not use the Wi-Fi. There is a great grocery story a couple blocks away and other shops on Main Street. Don't miss the 5 mile or so drive out of town to see the Oregon Trail Historic Site. You can still see the ruts from the wagon trains. We will be back to stay here; it's a great little RV park. We camped at Vale Trails RV Park in a Motorhome.